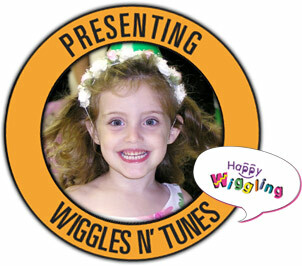 The Official Wiggles N' Tunes Web Site! Children were born to sing and love to create sounds! From an infant cooing and gurgling to a toddler tapping on a pot with a spoon, music is a natural creative expression from the earliest age. Begin nurturing your child's natural love of music by making memories that will last a lifetime! Wiggles N' Tunes one-of-a-kind, award winning early childhood music enrichment classes and birthday parties offer fun-filled playful tunes performed with a unique twist, guaranteed to captivate every child's attention with hand-on feet-tapping fun! For well over a decade Wiggles N' Tunes has been performing to sold out performances in New Jersey with children dancing in the aisles! See for yourself what the children are dancing about! ©2000-2008 Wiggles N' Tunes, Inc. • All Rights Reserved.